In this episode, the digidestined unite to brave a trip back into the Digital World and find their partners, memories or no memories. But we need to talk about Maki and Meiko first, don't we? After the climactic (well... only) battle and its horrible consequences, the side of the story here featuring the digidestined as a whole feels like an epilogue. Not one of... those kinds of epilogues, but something closer to the one in Tamers. Not a lot of new information to process, maybe a nice bow for one or two character arcs, and a resolution that, while not undoing the bleak ending, offers a spot of hope for the future that might help them recover from the traumatic events they just suffered through. From the kids, that's what we get and it's appreciated. 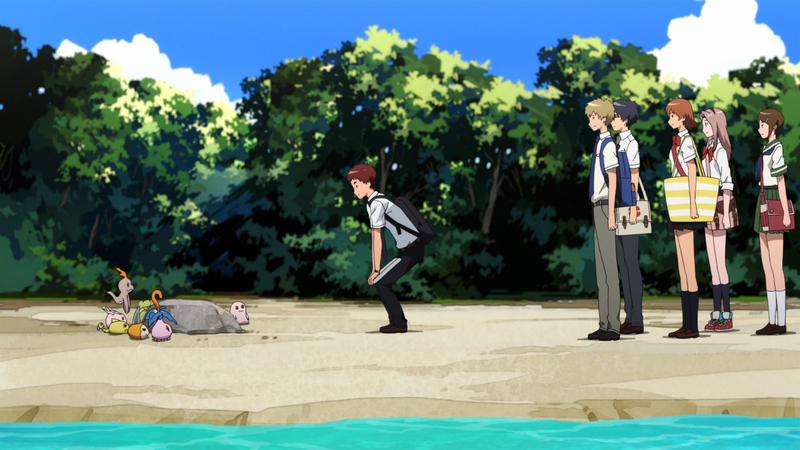 A week after losing their Digimon, they're trying to get back to life but clearly not okay. They all have a moment of revelation that not only are they all not okay with it, but they're the goddamn digidestined and ought to do something about it. They pull some strings, kiss the real world goodbye, and set out to reunite with their Digimon regardless of whether or not they'll be remembered. They aren't, but are ready to start the process all over again. Koushiro even applies what he learned from Tentomon to break the ice! It's a beautiful way to bring things full circle and set us up for the second half of tri. It's just that surrounding all of this is a bunch of really weird stuff that gets thrown at us at the last minute. All of that is less Tamers epilogue and more... well, you know. Of course there will be future movies to resolve these things, so we can't begrudge a couple new mysteries. But to throw all of it at us so late, and to toss back in elements from the first two movies that never featured in Confession, scrambles the board and leaves us feeling like the pieces are all in the wrong place. In Meiko's case, her role in the episode is very important. We learn how she was introduced to Meicoomon and she admits to Takeru she knew her partner was the source of the infection and was too ashamed to admit it. Takeru shows poise and maturity in forgiving her, although really he damn well better since he knows he's guilty of the same thing. But her story raises a number of disturbing questions that may get lost in the shuffle with everything else happening. She looks young enough that she met Meicoomon not long after the events of Adventure and certainly before Zero Two. Her father being part of a team researching Digimon that soon is a big deal, and we have to ask what they were doing when Digimon started cropping up globally in 2002. There's also Meicoomon somehow knowing Meiko's name, that funky pattern on her digivice and why the infections only started recently. It's a lot to take in at a time when we're unlikely to retain it. Meiko's hesitation also makes her miss the bus to the Digital World, leaving her the only relevant digidestined and one of only two main characters left home. And it's not like we know much about her association with Daigo the way we've seen her and Maki. What's incredible about Maki is just how many different ways you can read her and her motivations. With seemingly no change in attitude, she tries to keep the digidestined happy while viewing them as tools in her arsenal. She suppresses investigation into the 02 kids while showing deep concern for them. After the reboot she wants everybody to forget and let time take its course, then goes out of her way to cooperate with Koushiro to get them into the Digital World... where she then shows up to meet the Kaiser who is actually Gennai who seems happy the digidestined reunited with their partners even though he's closely associated with Homeostasis who initiated the reboot that drove them apart in the first place. It's easy to assume she's up to no good. Those devilish smirks when witnessing Leomon's death, agreeing to send the kids in and meeting the Kaiser do her no favors. She seems to know more than her agency about Meicoomon's role in the infections and the nature of Homeostasis and the reboot. She also happens to have a black D-3 to help open the gate (which the digidestind find awfully curious but somehow don't feel up to questioning). 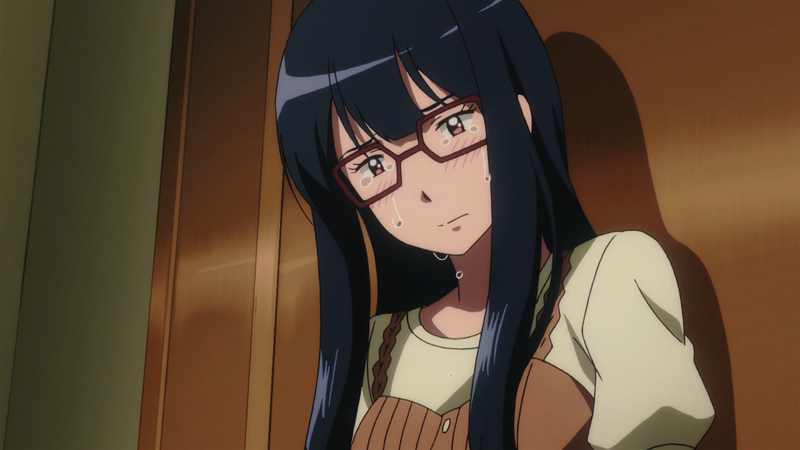 At the same time, she only does all this because the digidestined ask her to, knows they have enough problems without having to fret over their missing friends, and may not trust Meiko's father (possibly extending to others in the agency, including Daigo). 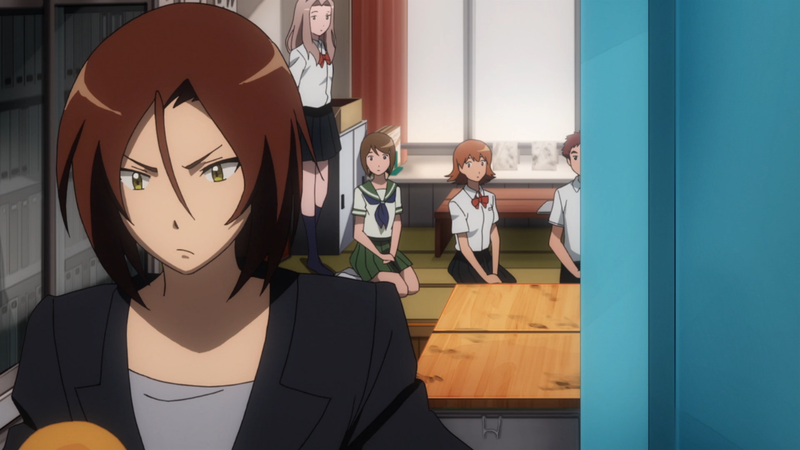 There are plenty of red flags to suspect foul play, but Maki meeting Gennai may be poetic as she may yet prove to be looking out for the digidestined and steering them on the right course after all... only by being shady, secretive and manipulating a bunch of stuff behind the scenes. Like episode 11, the quieter moments here do such a good job illustrating how the digidestined are trying but struggling to resume regular life. Sora and Mimi wearing their hair differently (which traditionally symbolizes moving on) but quickly going back was an interesting touch. Maki's statement about everybody eventually forgetting about Digimon, including the digidestined, sounds menacing but is a sad reflection of reality and our ability to forget things that are troubling or inconvenient. Despite Maki's relief that the Digital World didn't sink into the quantum sea, there are several signs that the reboot didn't totally work. Takeru's D-3 still can't open the gate, Koushiro and Hikari sense something off about the Digital World, Ultimate forms are going at it, and of course Meicoomon still remembers Meiko. The use of the whistle is beautiful and sentimental and all, but does raise questions about how Nyaromon still has it after six years, a reboot, and a month living in the real world. While we should expect Takeru to forgive Meiko, it's important to note that he also sticks up for her when the others learn the truth and aren't as understanding at first. What's really complicated about Maki's D-3 is that it appears to be the same one we saw at the start of Reunion that we all assumed was Ken's... but doesn't actually match the D-3 design Ken had in Zero Two or Takeru and Hikari have here. Door's open for rampant speculation. The Alphamon and Jesmon fight is definitely one of those distractions we didn't need to wonder about with everything else going on. Especially since we don't know exactly why they're fighting or who we're supposed to be rooting for, but since Jesmon's the evolved form of that Hackmon feller we've seen all over the place, we know it's going to be important. Labels: Maki, Meiko, movie, tri. Since Takeru hid infection of his digimon too, we should expect that he understands Meiko's fear. However, this is still quite mature from Takeru if we take into account that infection of Patamon (and other Digimon) and all the pain that he suffered in Kokuhaku is probably due to interactions with Meikuumon.